In this article, I am going to explain all of these factors in great detail. You can improve your business bottomline by reducing the cost per acquisition. You can target your best clients more effectively by structuring your marketing campaigns around them. But first you need to be with me, on why you need to focus on acquiring more of best e-commerce clients and less of low value clients. Unless you operate on a very low profit margin, where any decrease in sales volume will quickly erase profit and result in net loss, there is absolutely no excuse for you, to not to focus on acquiring more of the best clients and less of the low value clients. Companies like Walmart, Tesco and other FMCG giants operate on very low profit margin. Since they operate on very low profit margin, they have to focus on improving the top line growth, like sales volume to remain profitable. If they don’t, then they will incur huge losses and will soon be out of business. But this is not the case with majority of businesses out there. Majority of businesses out there are small to medium size, and they do not operate on very low profit margin, but yet they continue to function in a way like, that they operate on a very low profit margin. So they need lot of clients, any client will do. From the table above you can see that the gross profit is higher in case of New York City clients. But since the focus has always been on topline figures like orders and sales, the marketing budget is spend on acquiring clients from all over the US. Yes your sales is higher when you target all of the US. Yes you get 3 times more orders when you target the entire country. But at what cost? There is a metric called ‘Return on Advertising Spend (ROAS)’. It is used to measure the cost effectiveness of a marketing campaign. Not many marketers talk about it because it includes “cost” and many of us are committed to focus only on the topline growth: traffic, conversions, orders and sales in the name of improving the business bottomline. But the fact is, we can never truly improve the business bottomline by ignoring the “cost”. So let us calculate the ROAS. So for every dollar you spend on acquiring clients from New York City, you earn $10.5 in return. So for every dollar you spend on acquiring clients from the rest of the country, you earn $2.13 in return. So your marketing dollar would be better spend, in acquiring more of New York city clients and less of clients from the rest of the country. As long you will ignore the business bottomline metrics like “cost”, you can never focus on acquiring more of best clients and less of average/low value clients. 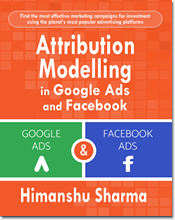 From the table above we can conclude that, the cost per acquisition will remain high if you target whole of the US through search marketing campaigns or any other ad campaigns. So it is pretty obvious that your total ad spend is going to remain high, for acquiring average clients and you will remain less profitable for the foreseeable future. As simple and obvious as it may sound, many business owners have no idea where their best clients are coming from. You need to know your most profitable geo locations. “But hang on, shouldn’t you be using metrics like ‘conversion rate’ or ‘average order value’ to determine most profitable regions”, you may ask. My answer is “NO”. The reason being, I give preference to number metrics (like raw conversions, sales volume) over ratio metrics (like conversion rate, average order value). If you are avid reader of this blog, this should not come as a surprise to you. 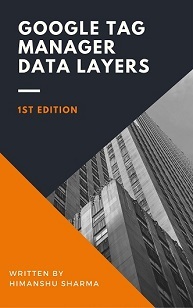 Because of data collection, data interpretation, data reporting and optimization Issues, ratio metrics like conversion rate and average order value are not reliable for taking business/marketing decisions. 1. Is my conversion rate calculation accurate? 2. 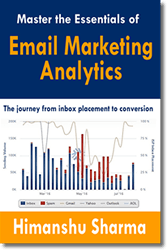 Is my conversion rate statistically significant? The conversion rate calculated by Google Analytics is not accurate by default as GA treat every person who has visited your website as your potential client and hence put everyone in the conversion funnel while calculating conversion rate. 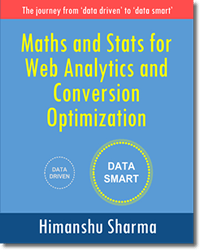 Also Google Analytics is not going to tell you whether or not its conversion rate is statistically significant or whether the difference in the conversion rates of two or more marketing campaigns is statistically significant. Similarly GA won’t tell you whether your ‘Average order value’ is statistically significant. So just because someone from say ‘wisconsin’ placed a huge order in a single transaction, does not automatically make the region a profitable location to target. I am the confidence you need, to play with conversion rates. Yes you need a very good understanding of statistics to play with ratio metrics, without getting burned. Only handful of marketers/analyst go to great lengths to calculate statistical confidence, each and every time, they play with ratio metrics. Then there are marketers/analyst out there, who take marketing decisions on the basis of statistical significance but statistical significance alone. So if the increase in conversion rate is statistically significant, then they declare ‘SUCCESS’ in their A/B or multivariate test. But what if their success is not practically meaningful. What if their results are statistically significant but still trivial or statistically insignificant but still important? So what they are doing wrong here? Well they are not taking ‘effect size’ into account. “What is effect size?” you may ask. Do you see the issues with ratio metrics now? In my opinion and experience, any person who is not good in maths and statistics behind web analytics should not be taking business/marketing decisions based on ratio metrics alone. I avoid taking decisions on the basis of ratio metrics alone, as much as possible even though i have pretty decent knowledge of statistics. Now back to determining the most profitable locations. 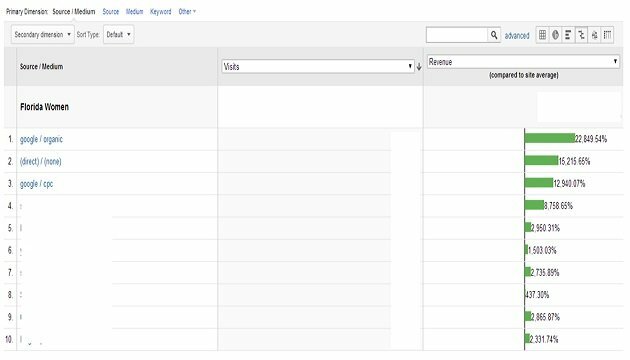 Go to ‘Location’ report (under Audience > Geo in your Google Analytics account). Click on the percentage tab. Select ‘Revenue’ from ‘contribution to the total’ drop down menu. Select the most recent time frame (say last 3 months). From the report, we can conclude that, majority of sales comes from ‘Florida’. Which also means, that our best e-commerce clients live there. So it is prudent to focus on this region. Now I want to know the demographic details of my best customers so that I can understand them better. Demographic data can be age, gender, education, occupation, income etc. Through demographic data you can determine how your best customers’ behaviour varies by gender (male or female). For example, do men buy more from your website than women, or do women buy more. 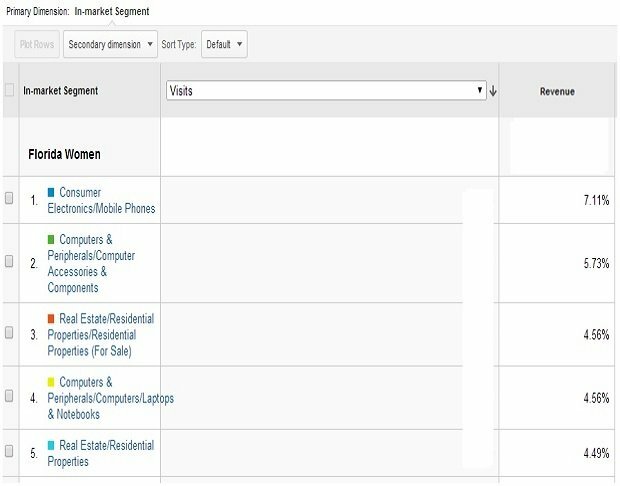 To get the demographic data in Google Analytics reports, you need to enable the demographic reports by going to Audience > Demographics > Overview and then click on the ‘Enable’ button. Once you have got the demographic details, you can structure your contents and marketing campaigns accordingly. For example, promotional efforts, ads, contents etc. that works well on men, may not work on women and vice versa. 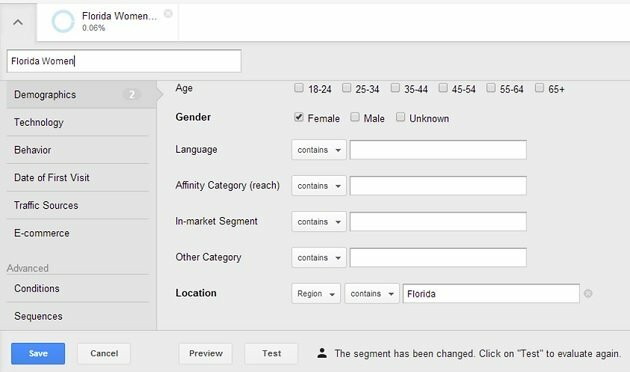 You can use the demographic data, to build and apply advanced segments to your Google Analytics reports and can greatly improve your understanding of the target audience. Now go to the ‘Age’ report (under Audience > Demographics in your GA account), click on the percentage tab and select ‘Revenue from ‘contribution to the total’ drop down menu. Make sure that the Florida segment has been applied to it. From the report we can conclude that majority of people from Florida who buy the product are in the age group 35-44 years. Now go to the ‘Gender’ report (under Audience > Demographics in your GA account), click on the percentage tab and select ‘Revenue from ‘contribution to the total’ drop down menu. Make sure that the Florida segment has been applied to it. From the report we can conclude that majority of people from Florida who buy the product are women in the age group 35-44. Well that is all you can find from Google Analytics at the moment regarding the demographic data. There is one caveat here. 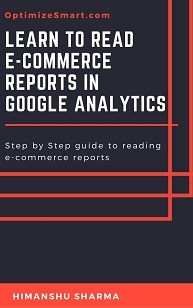 You can’t blindly rely on just the Google analytics data. This is because GA demographic data is based only on the subset of your total site visitors. This data is not available for every single person who visited your website. 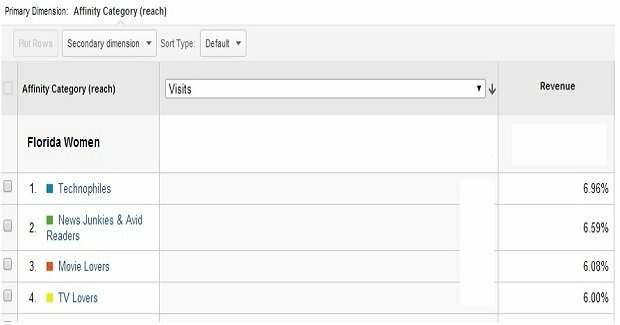 If your demographic reports are based on more than 500k visits then Google Analytics is going to sample your data badly whether or not you use GA premium. There is no escape from data sampling issues in GA. Contrary to this, if your demographic reports are based on only say 10-20% of your total site traffic then you will get inaccurate picture of your visitors’ demographic details. Remember demographic reports were introduced in Google Analytics only few months ago. 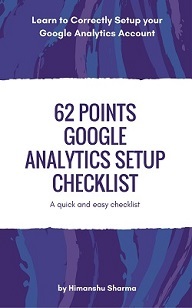 So you should not rely on Google Analytics alone for all of your demographic data needs. There are tons of tools out there which can provide demographic data of your target audience and in much more detail. 5. Popular Industry blogs and online magazines – industry blogs and magazines can provide lot of valuable insight about the demographic of your target audience. 6. Online surveys tools – survey tools like https://qualaroo.com/ is an excellent way to know anything about your target audience. I recommend using online surveys all the time. 24 hours a day, 7 days a week. 7. Contests – another good and clever way to collect demographic details of your clients. 8. Your client – if your client has been running a well-established and profitable business for a long time, he/she can provide you with valuable insight about the target audience. 9. Facebook Insight – works well if you have large fan following. 10. Follower Wonk – works well if you have got lot of followers. 11. 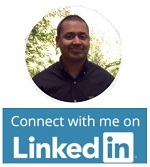 LinkedIn Analytics – depending upon the industry you are in, you can get lot of valuable insight from this tool. Psychographic data can be interest, personality, lifestyle, values, beliefs, liking, disliking, affinity etc. 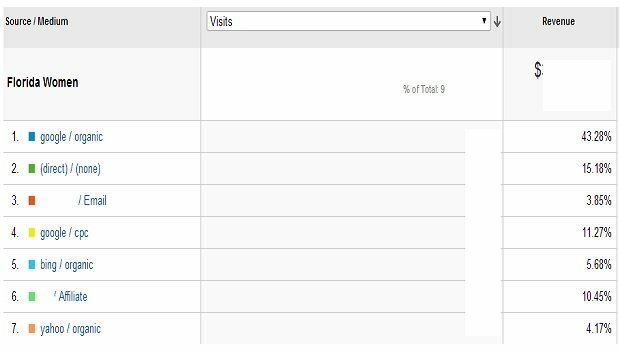 Once you have enabled the demographic data in your GA account, you can also view the psychographic data in your GA reports. Through psychographic data you can create a better and stereotype-free gender based marketing campaigns and contents. A stereotypical gender based campaign can be something like using ‘pink’ colour for the display ads, selling only soft toys to young girls (like there are incapable of playing with any other toy), developing the so called “girly design” for landing pages, writing cookery/child care/home improvement contents just to target women. Not all women like ‘pink’ colour. Not all women are interested in learning about home improvement and other domestic stuff. But that’s how it goes when marketers have to drop ‘gender’ into an ad campaign. You can see this gender based stereotype imposed on people everywhere from billboard ads, product shelves to TV ads. This ignorance comes from not understanding the diversity of preferences among men and women. Marketers need to move on from the pure gender based segmentation to psychographic based segmentation. So if your target audience is mainly women then structure your contents and campaigns according to their liking, personality and interest and not on the basis of what all the women are assumed to like in general. Not all women are the same. So you can’t have ‘one size fit all ads/contents’ for women. Same applies for men. You will notice here that I have not selected the age group ’35-44’ while creating this advanced segment even when the women in the age group 35-44 buy the most according to Google. This is because I don’t trust GA demographic data that much. After all this demographic data is just a subset of the overall data. So in order to minimize error, I have deliberately choosed not to segment this data further by age-group, affinity category, in-market segment and other categories. The more I will segment this data, more inaccurate will be my analysis and interpretation esp. if I am dealing with small data sample. Now open the ‘Affinity Categories’ report (under Audience > Interest in your GA account), click on the percentage tab and select ‘Revenue from ‘contribution to the total’ drop down menu. Make sure that the new ‘Florida Women’ segment has been applied to it. From the report above we can conclude that majority of Florida women are technophiles, news junkie, avid readers, TV lovers, Music Lovers and travel buffs. Now open the ‘In-Market Segments’ report (under Audience > Interest in your GA account), click on the percentage tab and select ‘Revenue from ‘contribution to the total’ drop down menu. Make sure that the ‘Florida Women’ segment has been applied to it. In-Market Segments are the segments in which people are most likely to be ready to purchase products or services. So according to the report above majority of Florida women who are most likely to make a purchase are from the consumer electronics and real estate market segments. So you can pretty much assume that my target audience is tech savvy and probably use multiple devices to browse the web. However all of the psychographic data you have acquired so far is still a hypothesis as it is based on just one tool called ‘Google Analytics’. In order to confirm your hypotheses you must collect data from multiple data sources and integrate them before your draw any conclusion. Since psychographic data is a subset of demographic data, whatever tools you use to get demographic data can be used to acquire psychographic data. From the report above we can conclude that Florida women who make maximum purchase from the website are returning visitors. So getting repeat visits is very important for this website and this is possible only through user engagement. 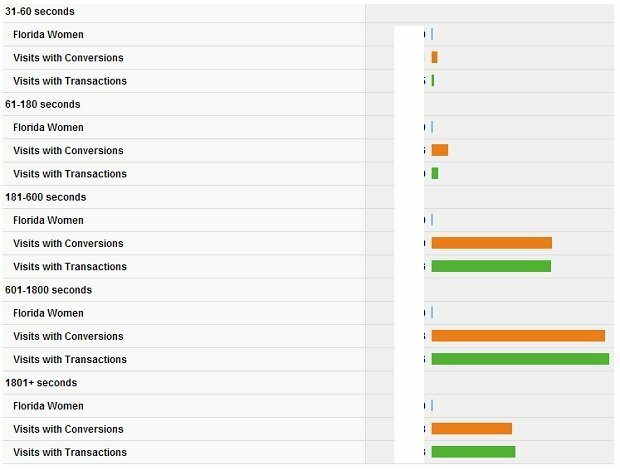 Now open the Engagement Report (under Audience > Behavior in your Google Analytics account) and apply two more advanced segment called ‘visits with conversions’ and ‘visits with transactions’. From this report we can conclude that I need to hold my target audience for at least 180 seconds or 3 minutes on my website to get any possibility of conversion and sales. Any visit duration which last for less than 3 minutes is not profitable for my client’s business as it won’t likely result in sales. This analysis again highlight the importance of developing strong user engagement with the target market. Open the ‘All Traffic’ report under ‘Acquisition’. 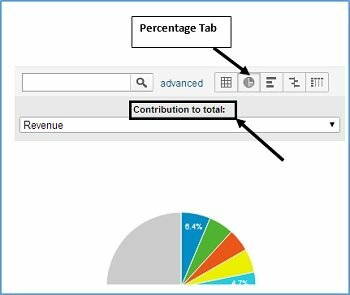 Click on the percentage tab and Select ‘Revenue’ from ‘contribution to the total’ drop down menu. From the report above we can conclude that the best e-commerce clients come from Google organic search. So compared to the site average, the performance of Google organic search in terms of generating sales is highest. So once again we can conclude that the best e-commerce clients come from Google organic search. So SEO is very important and profitable for the website. If you can determine the type of contents being consumed by your best clients, you can produce more of such contents to increase your sales. One of the most important and yet not so obvious difference between a low converting website and a high converting website is the volume of profitable contents on the site. 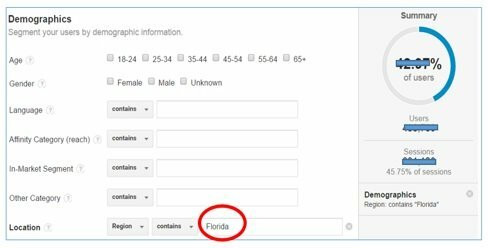 Create ‘Profit Index’ custom report in your Google Analytics account and then apply the ‘Florida Women’ advanced segment to it. Note: Use ‘Page Path Level 1’ as your primary dimension while creating the profit index custom report. Profit index is a database of all those web pages on your website which have the capacity to trigger conversions and/or transactions. I have explained in great detail about creating profit index in this article: Optimizing Contents for Sales and Conversions through Profit Index. Read this article if you are not sure about how to create a profit index for your website. 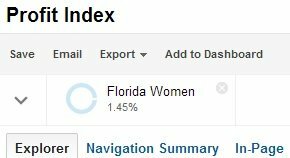 Once you have the profit index report with the ‘Florida Women’ advanced segment, you can determine the type of contents being consumed by your best ecommerce clients. Click on a content category to dive deeper and determine which contents are being consumed in that category. You need to develop more of such contents to increase user engagement and sales. Sell what is selling and sell even more. There is no point spending time and money on products which people rarely buy. Focus on the products people buy the most esp. your best ecommerce clients. From this report you can determine the type of products being purchased by your best ecommerce clients. Understand that this is an over simplified guide for finding and engaging with best ecommerce clients. 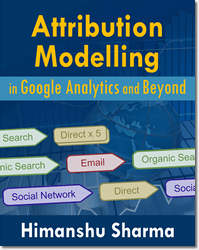 I have not taken many factors into account like: seasonality, attribution modelling, customer life time value, ZMOT etc. I have not really used many data sources for my analysis. In my analysis there is almost always a clear winner. This may not be the case with you. May be you have multiple profitable locations. May be in your case both men and women generate almost equal volume of sales. May be you need to dive deeper and determine which cities in Florida are most profitable. May be targeting Tampa women will generate more sales than targeting Orlando women. There can be so many situations that it is impossible to factor them all in just one blog post. But hopefully you now have a better understanding of finding and targeting your best ecommerce clients.